As you might have noticed there hasn't been new posts in this blog for quite a while. The main reason is that my "offline" musical life became more active. My duo with the oboist Zoltan Hornyanszky came to live once again after a 3 year break. We got engaged to participate in the Saint Donat Festival in Zadar (Croatia). Our concert was held in 24th July with great success and there are in the near future some performances to be organized which means more practice and rehearsals. Besides the duo I'm starting with a new musical project with several musicians which envolves arranging and composing a lot of material. And all this without mentioning my family "obligations" and other duties as well. Soon a new school year will start and that means work (I'm a guitar teacher). Because I don't want to make this Internet stuff my main way of occupying my available time I decided to end this blog. But that doesn't mean I'll not write anymore about Barrios. All the material from this blog has been transfered to my main blog A2Z Guitar and located under the category "Chief Nitsuga". From now on everything I intend to post about Barrios will be done in the above mentioned place. I'll also use some of its material in my future forum Learn About Guitar, therefore I invite anyone who cares about sharing culture to participate in it. If anyone wants to contact me that is possibe by posting a comment in "About this blog" from A2Z Guitar (no need to register). Sorry for not giving you my own e-mail adress but I want to avoid spammers. Hope to see you in some of my online spots! Religious beliefs and experiences also played an important role in Barrios' compositional process. Una Limosna por el Amor de Dios (An Alm for the Love of God) is another example of a religiously-inspired work. This incredible guitar piece is also known as El ultimo trémolo (The Last Tremolo), or El último canto (The Last Song). A clear sign of Barrios' mysticism is the birth of his new persona, Cacique Nitsuga Mangoré, the “messenger of the Guaraní race”. Barrios' religious convictions were more theosophical than strict Catholicism. For him God and Nature are inextricably part of one another, and Man, being part of Nature, is part of God. impregnate my spirit as the ethical end of all existence." La Catedral is undoubtedly a monument to religion but at the same a tribute to Bach. Click here to read more about La Catedral. Since 1919 Barrios starts studying very seriously the music of the great composers from the previous centuries. Soon he transcribes for the guitar works from Beethoven, Chopin and Schumann. This discovery of the European repertoire becomes a strong influence on some of his compositions such as Romanza en Imitació al Violoncello, Estudio de Concierto, Mazurka Apasionata and Allegro Sinfónico. The affinity Barrios felt with the nineteenth-century masters no doubt served as inspiration for some of his music as is the case of his six minuets. Early in his career Barrios transcribed the well known Minuet in D by Beethoven (whom he admired to a great extent), and it is known that he also performed minuets by Fernando Sor. Imitating the compositional style and techniques of the Baroque period (of Bach’s work, to be more precise) was another side to his craftsmanship. 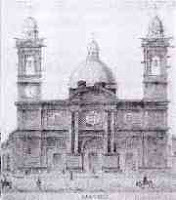 La Catedral may be viewed as Barrios' imitation of Bach. It is believed that this guitar master piece was inspired by a religious experience that Barrios once had which hence deserves to be categorized under religion as well. Barrios discovered the music of the great Spanish guitarist and composer Francisco Tárrega (1852-1909) around 1917, and grew to admire him very greatly. Recognizing the importance of the Spanish master’s work in the development of the guitar, Barrios declared: “Without Tárrega, we would not be”. Thereafter he began composing some of his best works. In 1939 in Guatemala, Barrios composed Variations on a Theme of Tárrega which consists of a set of six variations on Tárrega’s ever popular "student" work Lágrima, creating a sophisticated virtuoso display of the theme, using arpeggios, appoggiaturas, tremolo, melodic harmonics, and other devices. This piece is one of his most mature compositions, reflecting a lifetime of devotion to and a thorough mastery of the instrument he loved. This were just some examples on the use of imitation in Barrios' music. Barrios’ guitar works were largely late-Romantic in character, despite his having lived well into the twentieth century. Many of them are also adaptations of or are influenced by the folk music of Latin America, and mostly of them are of a virtuosic nature. In this post I would like to leave you with just a few words on the folkloric elements heavily present in Barrios' guitar works. The folk music of Paraguay (including the polca paraguaya, vals and zamba) provided the young guitarist Barrios with his first introduction to music. Barrios paid tribute to the music and people of his native land by composing pieces for classical guitar modeled after folk songs from South and Central America. He composed Choros (which is a form born out of Rio de Janerio), Tangos (originated in Argentina), Cuecos (from Chile), and Danzas Paraguayas (from his homeland Paraguay), amongst others. These are just some examples of a perfect marriage between folklore and classical guitar. Without question one of the most famous guitar compositions is La Catedral. It is one of the most preformed guitar pieces written by Agustín Barrios Mangoré. This impressive work (a real guitar monument) was written in 1921 as two-movement piece without the famous Preludio. The work got even highly praised by the very own Andrés Segovia - the biggest authority on the classical guitar at the time. An unusual fact, considering that Segovia didn't admire much Barrios' guitar opus. Barrios dedicated this guitar work to a beautiful cathedral located downtown in the capital of Uruguay - Montevideo. For many years it was thought that the piece was dedicated to the Asunción Cathedral in Paraguay or to the San José Cathedral in Uruguay. One of the possible reasons for such assumption is the fact of the three Cathedrals being very similar. Barrios played this piece quite often throughout his guitar performing career. In fact, more often than any other guitar pieces. That points to the assumption of how popular the piece became amongst guitarists and non-guitarists. Many years after writing La Catedral, Barrios added the exquisite Preludio thus completing one of the finest guitar compositions I've ever heard - and played. This new movement is subtitled as Saudade which means nostalgia. It was written in Havana in 1938, when Barrios was suffering from a decline in health. Lack of money and a consequent stress to his marital life even more worsen his health. By hearing this lovely guitar movement, one can feel the nostalgia for better times just as Barrios did, one guesses. Barrios performed La Catedral with the prelude for the first time in San Salvador on 25th of July, 1938. The second movement of this incredible guitar work is called Andante. Its character is religious and mystical and in some way works as an introduction to the third movement - an impressive Allegro Solenne. It's not surprising that the Andante and Allegro Solenne sound as a one unit itself because La Catedral was originally a two-movement guitar piece. Where to find this piece? If you're one of those who are looking for a free score of La Catedral, I'm sorry! You will have to wait some years until Barrios' opus enters in the public domain. He died on 7th of August , 1944 - almost 63 years ago (by the date of this post). That means his opus is still under copyright law. What I can do is to link you to some scores of Barrios' music that I have found at Sheet Music Plus. This online music shop has some nice offers. This is an edition by Richard D. Stover - the most qualified person to do the job in my opinion. It's in standard notation (no tablature) and includes fingerings and an introductory text. It was published by Alfred Publishing. Again by Richard D. Stover! This man dedicated his entire life investigating about Barrios. As a result here is Barrios' complete opus in a two volumes. For the first time in one edition you are offered with the complete collected works of Barrios. This is the first edition of Barrios music based on all available sources: manuscripts, phonograph recordings and published editions (pre-1970s). The two volumes are illustrated with period photographs, concert programs and Barrios own drawings. This volume contains 67 musical works including La Catedral. This volume includes 65 original compositions in standard notation plus a unique CD featuring Barrios himself playing 21 original works among which is La Catedral. Included are also 82 pages of exhaustive Critical Notes on the Barrios catalog. Did you ever hear the very own Barrios playing his own compositions?! I've also found his complete guitar recordings. The first one was made in 1913!, and the last one in 1942. Now they are re-mastered and available in a 3 CD set - more than 3 hours of music. And included in it is, of course, La Catedral. Click here to purchase it or get more information from Sheet Music Plus. I sincerely hope I've provided you with some valuable insight on this beautiful guitar work, La Catedral. In my opinion one of the most incredible pieces of music ever written for the classical guitar. Being himself of Guaraní origin (the aborigine population of Paraguay), Barrios started, from 1930 to his death, to be recognized as Agustín Barrios Mangoré (Chief Nitsuga). In that same year came the birth of Barrios' new persona, Cacique Nitsuga Mangoré, the “messenger of the Guaraní race”. Disillusioned with his success, Barrios developed this persona in order to attract a greater audience and at the same time pay tribute to his forefathers. During this episode of performances by Chief Nitsuga, Barrios would dress in full Guaraní tribal outfits. Barrios came up with "Nitsuga" by spelling backwards his own name, Agustín, and "Mangoré" was taken from the historical figure of Chief Mangoré, leader of the Timbúes people, circa 1528. After leaving Cuba, where he spent 6 months in 1938 and wrote the famous Preludio (subtitled “Saudade”), Barrios had a difficult and ran out of money. To make things worse his health started declining. During his stay in Mexico he was victim of a heart attack and respiratory failure. The medics who assisted him advised him to slow down with his activities. At the invitation of some friends Agustín and Gloria went to Costa Rica in August of 1938 where they practically lived under patronage. These were difficult times that resulted in marital problems between Agustín and Gloria as the tension of the situation increased. Employment was scarce and Barrios health was retreating. One of Barrios masterpieces was written in that year, the barcarole Julia Florida. Last years of Barrios’ life were spent in El Salvador. The very president, General Martínez, had invited him to recover his health in that country. Once Barrios felt better he got nominated Professor of guitar in the National Conservatory of Music. "I do not fear the past, but I do not know if I can overcome the mystery of the night." Barrios was buried in the following day in the Cementerio de Los Ilustres (Pantheon of Distinguished Men) in San Salvador.